The Baudelaire siblings - Violet (Emily Browning), Klaus (Liam Aiken), and baby Sunny - were living a fairy-tale existence until their parents died in a fire. The children are left in the care of their uncle, peculiar Count Olaf (Jim Carrey), an out-of-work actor who would love nothing more than to get his hands on the kids' money. 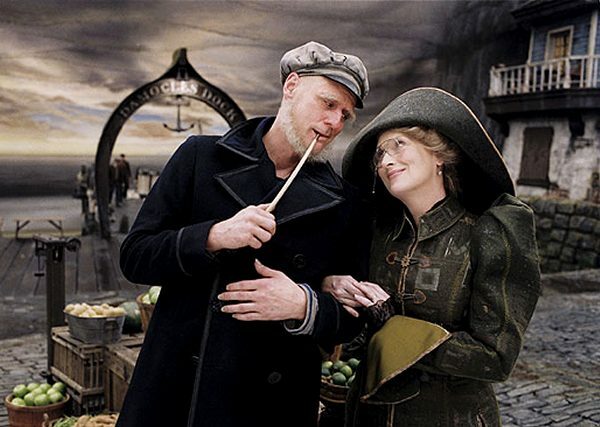 It doesn't take long for the children to figure out that Count Olaf is up to no good, and they try to steer clear of his various murderous schemes with the help of their other relatives, snake-fancying Uncle Monty (Billy Connolly) and wildly paranoid Aunt Josephine (Meryl Streep). An adaptation of the "The Bad Beginning", "The Reptile Room", and "The Wide Window" - being the first three books in A Series of Unfortunate Events by Lemony Snicket - the beloved children's books have been brought to the screen by Brad Silberling. Principal photography began in November 2003, using the sound stages and backlot at Paramount Studios in Hollywood. Director Brad Silberling avoided using too many digital or chroma key effects because he wanted the younger actors to feel as if they were working in a realistic environment. 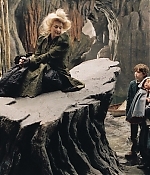 Among the children's caretakers in the film is their Aunt Josephine (Meryl Streep), a nervous widow who never turns on the radiator for fear it might explode, avoids her refrigerator because it might fall and crush her, and doesn�t use her telephone because of the danger of electrocution. Frightened of just about everything except grammar, Aunt Josephine lives in an old house perched precariously on a cliff high above Lake Lachrymose, a long and complicated description which here means �not a very good idea, especially because it is about to be hit by a hurricane.� �Aunt Josephine is a great tremulous little bird of a person who was an adventurer in her youth until something spooked her,� says Ms. Streep. �I just fell in love with this character who is terrified of absolutely everything, because at a certain level, so am I�so are we all,� she concludes, peeking out from behind a false bookcase. More intuitive and insightful than any of the adults in charge of them, Violet, Klaus and Sunny Baudelaire must employ every ounce of intelligence, ingenuity and courage to endure a series of fantastical misadventures that include an Incredibly Deadly Viper, a swarm of hungry leeches and dishwashing. Makeup designer Valli O'Reilly and Bill Corso won the Academy Award for Best Makeup. Production designer Rick Heinrichs and set decorator Cheryl Carasik (Art Direction), Colleen Atwood (Costume Design) and composer Thomas Newman (Original Music Score) were also nominated for their work at 77th Academy Awards in 2004. I wasn't expecting to enjoy "Lemony Snicket" too much - children's books adapations haven't been on my shortlist, and so did Jim Carrey's films. To my own surprise, I found "Lemony Snicket" a very enjoyable, very well done film. This is part to a soulful adaptation with characters to care about, thanks to believable actors and a message that is important and not as candy-coded as expected. The film is also darker at times than I thought it would be. 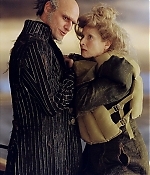 Regarding Carrey - if there's one role he's born to play, it's Count Olaf. I never liked any of his performances or films for being too goofy, over the top and annoying. Here, although playing a character who's all of the above, it works. Carrey vanishes into the character and makes it thoroughly entertaining. Since the film is mostly about Count Olaf and the Baudelaire children, many of the supporting roles - played by Timothy Spall, Billy Connolly, Catherine O'Hara and Meryl Streep, become cameos, but are all nicely done. 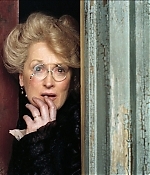 Especially Meryl, in her limited screentime, is hilarious as Aunt Josephine with just the right timing. Many things are being advertised as being an experience for both young and old - for "Lemony Snicket's A Series of Unfortunate Events" I wholeheartedly agree. Very recommended.